Grandfather thinks Mike is the cat's pyjamas, so he gives Mike a pet shop to run. The parrots answer the phones and the dogs have to be kept away from the Dog Biscuit Domino Competition. But will the villainous Dogbreath Dan spoil Mike's fun? Read how Mike Cool-as-You-Like runs his grandfather's radio station, takes a new approach to the airport, and soups up the supermarket. Grandfather is tired of eating peanut and spaghetti omelettes, so he asks Mike to travel the world to taste test new dishes. Mike eats deep-fried insects in Asia, pig's trotters in Europe, and crocodile in Africa. What will Grandfather like best? Read how Mike Cool-as-You-Like spends (and takes) time in Ireland, tries sumo wrestling in Japan, and plugs the leak in Venice. Read how Mike Cool-as-You-Like organises a Backyard Olympics, creates a video game for serious adults, and tries some extreme sports. Read how Mike Cool-as-You-Like takes part in Winter Games, travels to an active volcano, and saves the whales. Read how Mike Cool-as-You-Like builds a roller-coaster in a shopping mall, gets the library going, and puts "cool" into "school". 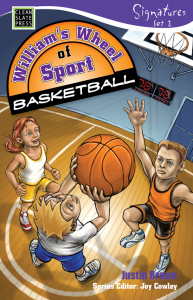 William spins his Wheel of Sport, and up comes Basketball, which means a basketball competition at school. It's William's team against Scott Porridge's team. Scott cheats, as usual, but William has a great incentive to find the hoop with the last penalty throw. 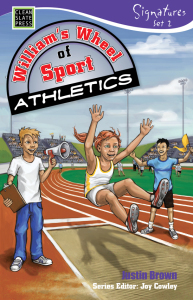 William spins his Wheel of Sport, and up comes Athletics, which means an athletics competition at school. It's William's team against Scott Porridge's team. Scott cheats, as usual, but William has a great incentive to run the fastest race of his life. 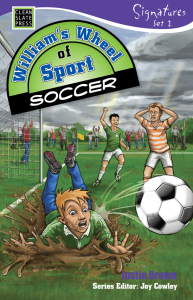 William spins his Wheel of Sport, and up comes Soccer, which means a football competition at school. It's William's team against Scott Porridge's team. Scott cheats, as usual, but William goes into goal to defend the penalty which will decide the game. 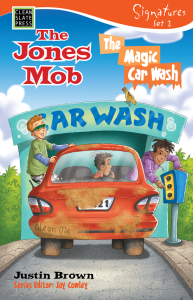 In the car wash Vance Jones hits the Surprise Me button, and the three Jones boys have a weird ride through a magical land. 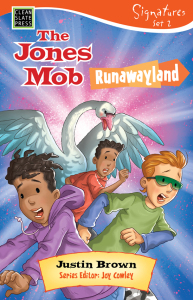 Andy Jones wants to run away from home, and finds himself in Runaway Land, where the children can do anything they like except for calling home. 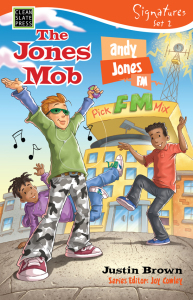 Andy each night listens to his favourite radio station until he realises that it's broadcasting directly to the students in his class, and paid for by their mothers. So now it's time to start manipulating the messages.